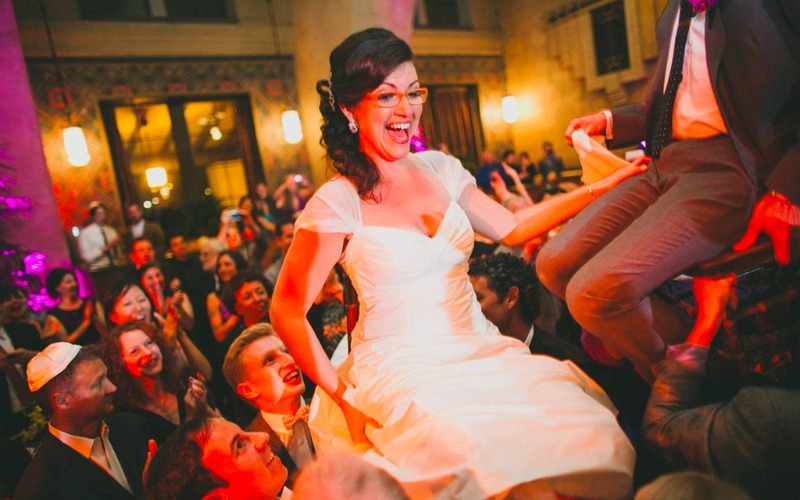 When it comes to Mash-Up Weddings, all you need is love. And planning. And communication. Oh, and mutual respect for differing cultures. And parents. And traditions. And bilingual priests. Maybe a translator? And, ultimately, a willingness to make a celebration and a relationship and a future all your own. And that can be daunting! So we’re thrilled to share the third in our series of Mash-Up Wedding photo essays, to provide inspiration and ideas for your own celebration. Here are our dear Mash-Ups Joseph Gabriel and Michelle Bachir. 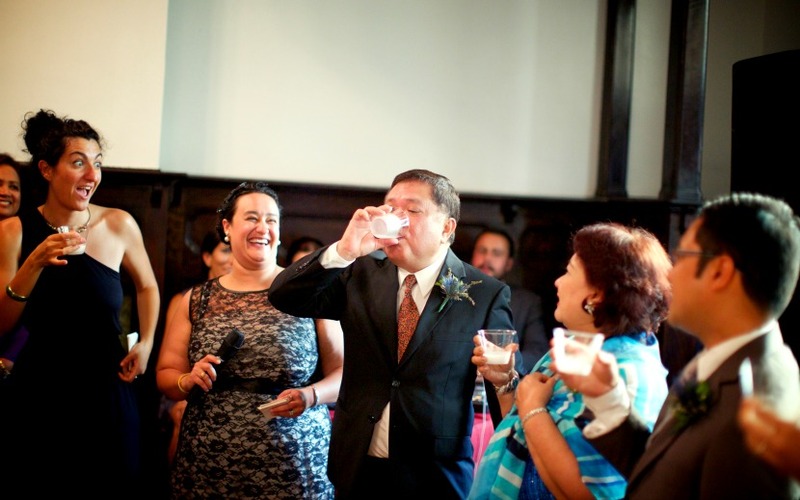 Joseph is a first-generation Filipino-American from New Jersey. Michelle was born in Lebanon and lived in London and Dubai before coming to the U.S. six years ago. 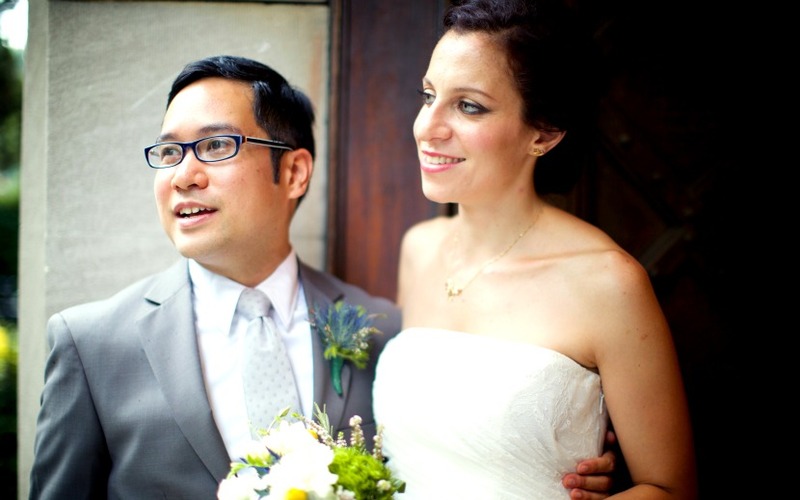 Joseph and Michelle met, wed and reside in New York City. This is their Mash-Up wedding story. 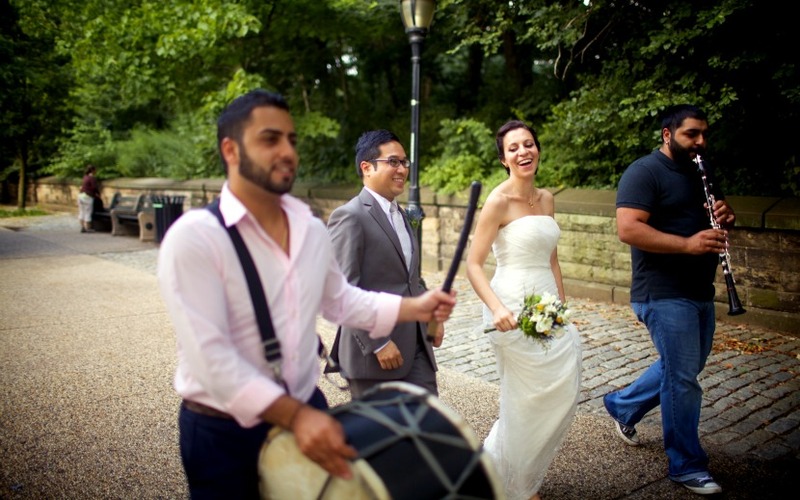 Joseph and Michelle’s first date was in Flushing Meadows Corona Park, in the melting pot that is Queens. The park was the site of the 1964 World’s Fair, which left behind remnants like the Unisphere — the 12-story-tall stainless steel globe where Joseph and Michelle decided to first meet. Two years after their first date, Joseph proposed. He presented Michelle with a vintage World’s Fair trinket engraved with the Unisphere as her engagement ring. 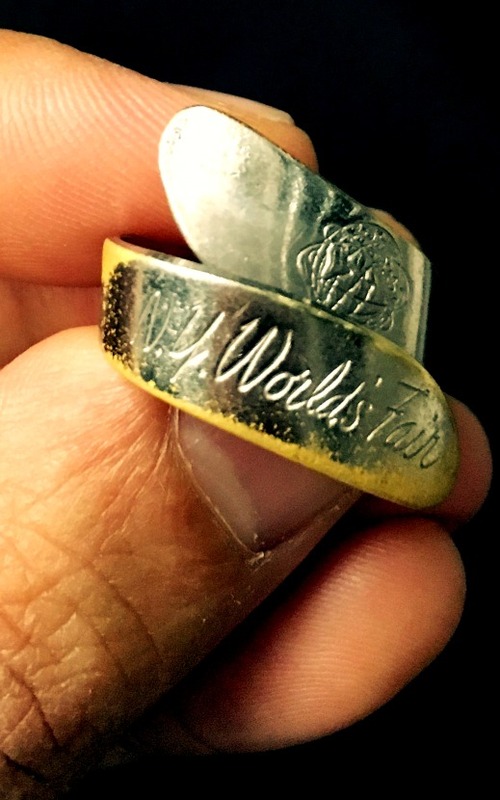 It is now Joseph’s wedding band. 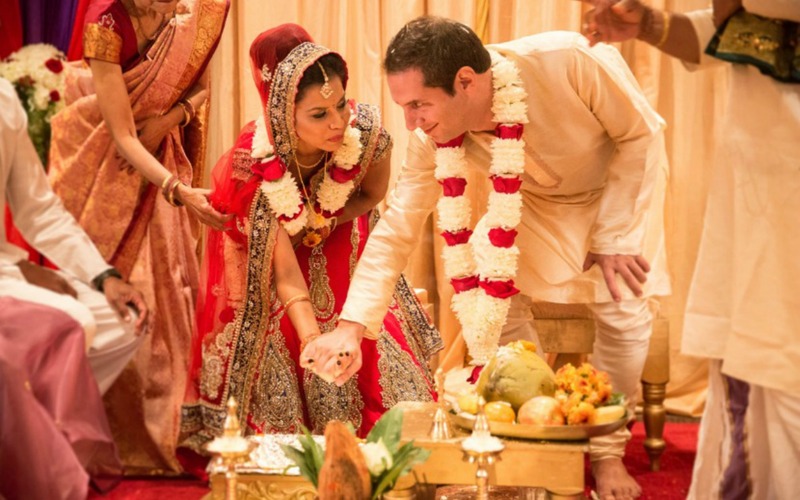 Joseph and Michelle decided to host their wedding in Brooklyn, where they live, but invitations were sent far and wide. 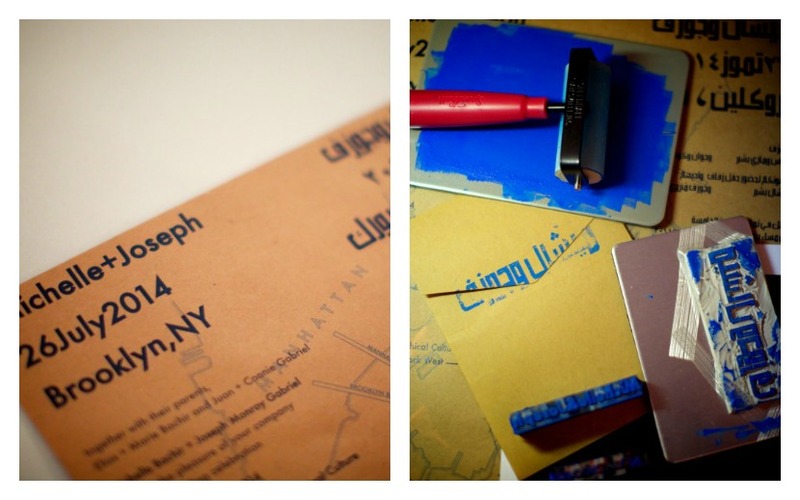 A dual English-Arabic format helped spread the message to family and friends around the world, which was delivered in envelopes sealed with bilingual stamps. 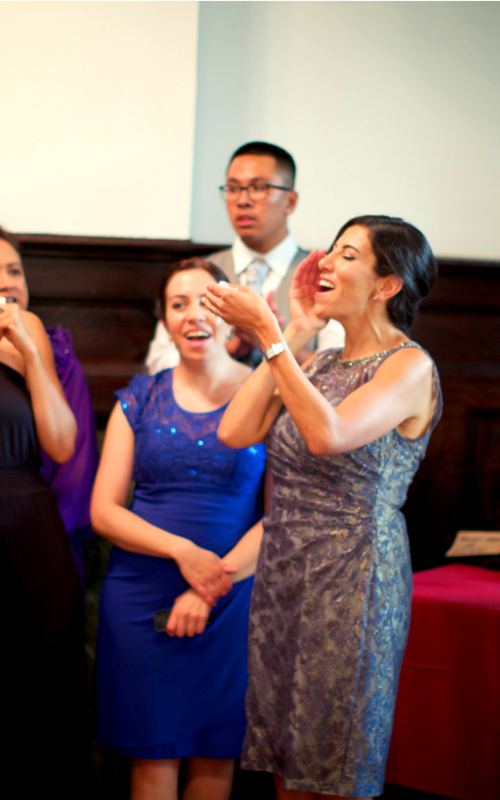 The City Clerk Marriage Bureau is a revered New York institution and Joseph and Michelle did not pass up the opportunity to get married there. 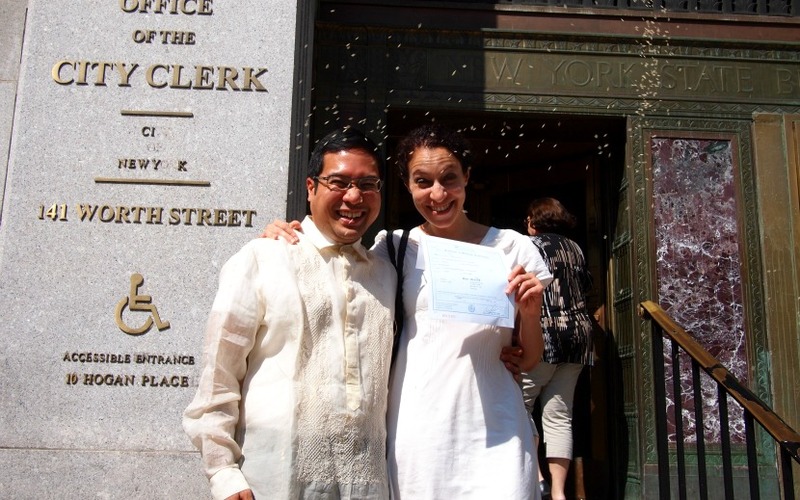 One Wednesday morning in July, Michelle put on a white summer dress, Joseph donned a barong tagalog — traditional Filipino formal attire — and they stood in line in downtown Manhattan. After a minute-long ceremony, they celebrated with friends over soup dumplings in Chinatown and with a walk across the Brooklyn Bridge. Here they are moments after getting hitched! 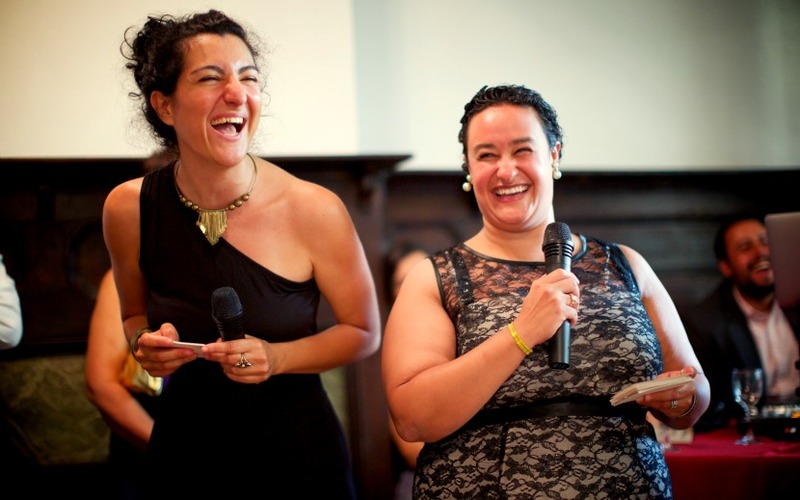 While the civil ceremony was their “official” wedding, Joseph and Michelle held their “real” wedding 10 days later at the Brooklyn Society for Ethical Culture. Guests assembled at the venue while the couple snuck away to start their zaffa — the traditional Arab wedding march that loudly announces the occasion. Here they are in Prospect Park at the start of the zaffa, five blocks away from the venue. When the couple arrived at the venue 15 minutes later, their families surprised them by lifting them high up above the crowd. Like the chair dances of other Middle Eastern cultures, lifting the couple is a staple of Lebanese weddings, but Joseph and Michelle were not expecting it at the onset of the ceremony. This photo shows a couple joyfully holding hands, but in reality they were just trying not to fall! Michelle’s sister, Roula, welcomed the guests with the zarghouta, the traditional Lebanese greeting recited in Arabic, announcing that the family’s youngest daughter was getting married. 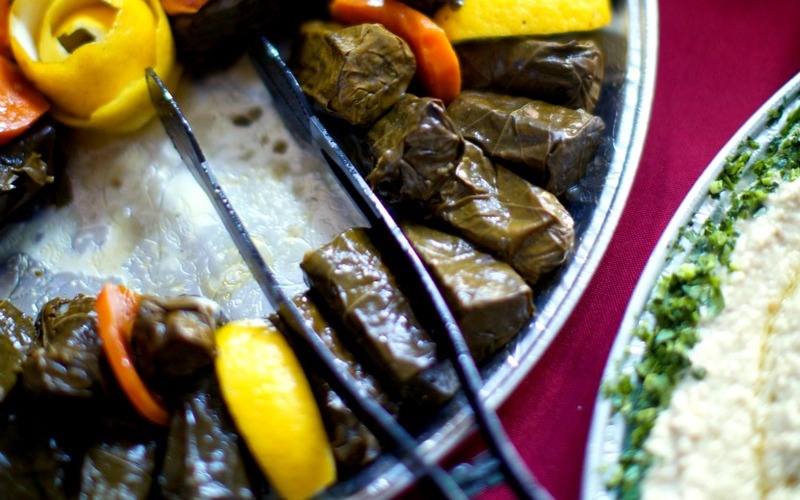 While not all of the guests could understand Arabic, the loud and boisterous ululating was an unmistakable celebratory sound. Nothing says “Mash-Up” like the melding of flavor profiles. 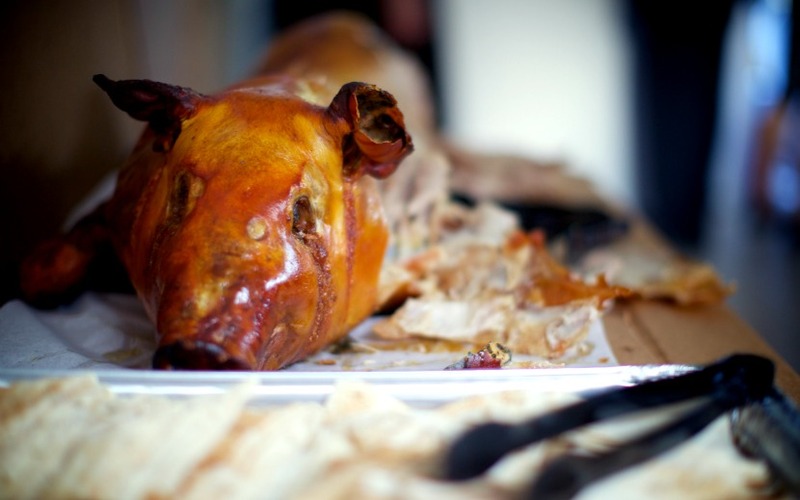 Joseph and Michelle chose a menu of Lebanese and Filipino dishes, ranging from warak inab (Lebanese stuffed grape leaves) to lechon (Filipino whole roasted pig). For dessert, Joseph insisted on representing his Jersey roots with a Carvel Cookie Puss ice-cream cake. 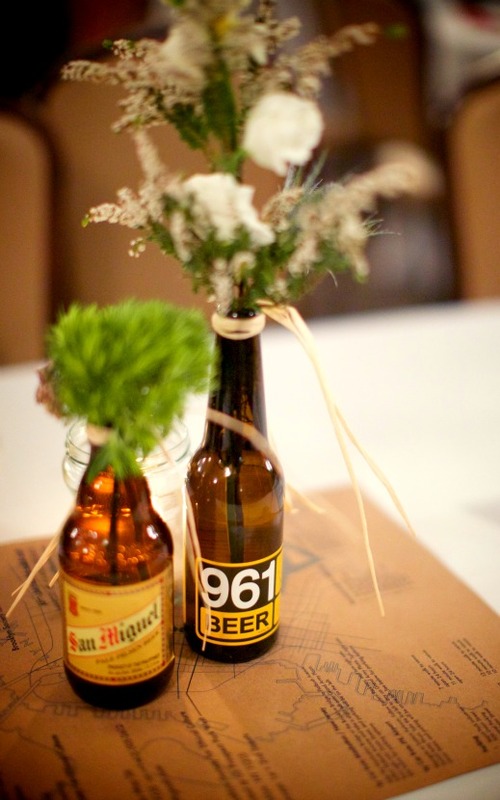 As an added touch, a pair of beer bottles — Filipino San Miguel and Lebanese 961, natch —held the centerpiece flowers at each table. Joseph and Michelle wanted to send their guests off with a special gift. They settled on olive oil soap made by Michelle’s family; sumac (a dried and ground berry with a tangy flavor); and zaatar (a mix of thyme and other spices). 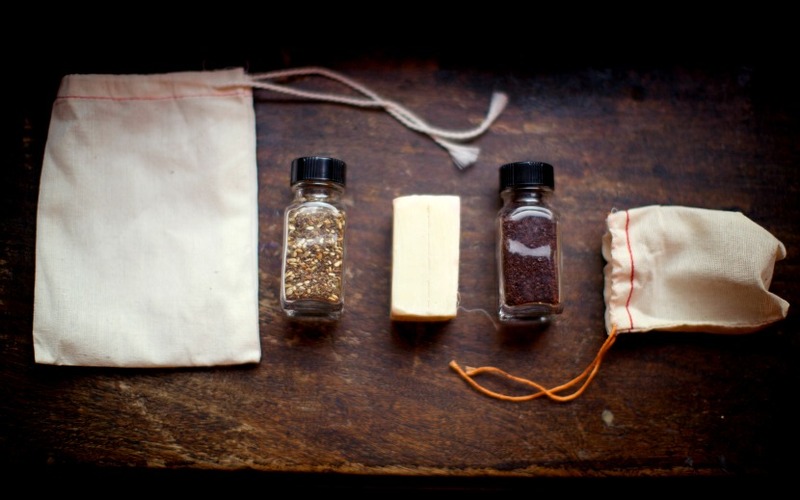 Early in their relationship, Joseph discovered these spices in Michelle’s kitchen and is now fond of experimenting with them in totally unorthodox recipes. The drummer from the zaffa stuck around for the music and dancing, layering his beat onto the DJ’s Top 40 selections. Late into the night, the crowd gathered around for the dabkeh, a style of Levantine Arab folk circle dance. 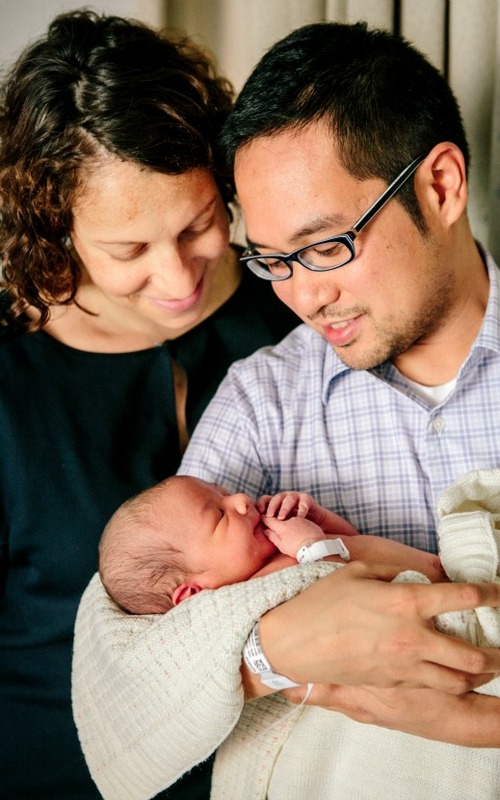 Michelle and Joseph recently welcomed their first child, a sweet boy named Rami, who’s keeping them busy! 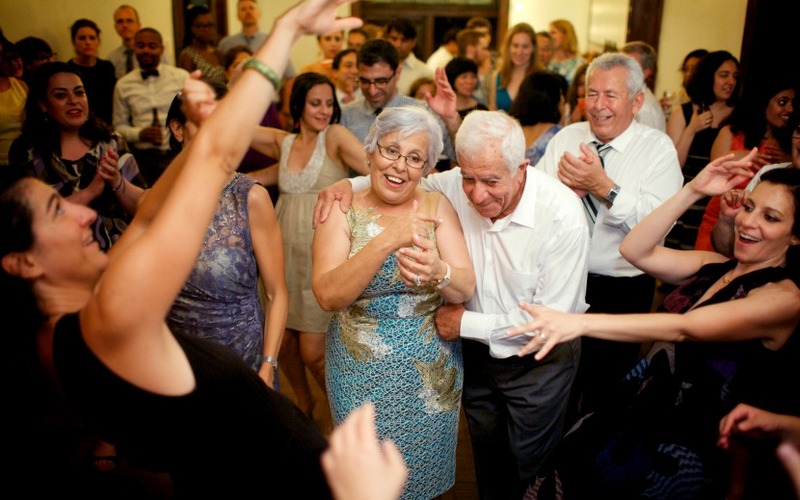 They’re looking forward to exploring what it means to be a Mash-Up “Leba-pino” family. Congratulations, Joseph and Michelle! Plus: Mazel Tov! You’re Engaged! Now What?